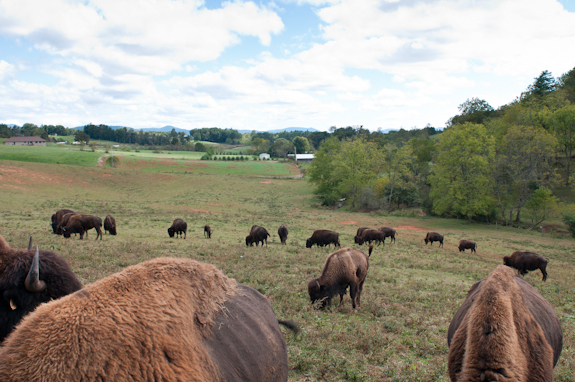 To celebrate my 50th birthday in style, the Bunkycooks decided to go On the Road (back in October) to visit Carolina Bison in the beautiful rolling hills outside of Asheville, North Carolina! No birthday be would be complete without a little excitement (and a bison burger!). This farm visit has to be the most exciting and thought provoking road trip so far. In fact, if you are a vegetarian or do not eat red meat, you might take issue with some of what is in this post, so I am just saying…Writing this article definitely took some stepping out of my own comfort zone as well. As you may know, we have been to many farms over the past several months to see where our food comes from and learn about the people and personalities behind our food. There is nothing quite as nifty (or as fresh!) as picking your own fruit and vegetables and bringing them home to cook that same day. It is also fascinating to see the process of making cheese beginning with milking the goats to the aging of the cheese. We have also been to a trout farm and prepared freshly harvested trout that evening for dinner. I cannot compare anything else to the taste we experienced when eating that fish. ASAP (Appalachian Sustainable Agricultural Project) has a saying: “Local Food that is thousands of miles fresher” and it truly is. This farm visit, however, was very different. I love animals and to see this American icon that is beautifully haunting and majestic up close, close enough to feed them by hand and look into their eyes, knowing that they are giving up their lives to feed us is a feeling that is hard to describe. There have been many articles about this topic recently, including this one, The Conscientious Carnivore, in the December 2010 issue of Food and Wine. When we see where our meat comes from and even participate in the process of harvesting, there is a new appreciation for these animals. Seeing them raised in this environment, grazing on the hillsides and knowing that they are humanely and lovingly treated and allowed to roam free until they are harvested, makes eating meat a totally different and certainly more personal experience. Most of us are so far removed from where our foods come from (especially our meats and poultry). Most of us buy processed packages of hamburger, steaks, bacon, pork or chicken in the store. If you are in the U.S., many of the labels list origins as U.S., Mexico and Canada. So, where is it really coming from? It could be from any one of those countries or all three. That doesn’t make me feel too good about what I am eating. Mr. Bunkycooks spent many summers on family farms when he was young, so for him this visit was more about learning about the bison than the farming practices. For me, the ability to visit a farm like this has had a major impact on where I want my meat to come from and the relationship we have to that meat. I want to know how it has been raised and more importantly, how it is harvested. We began our visit at Carolina Bison by meeting Dr. Frank King (4th generation farmer) and his son, Frankie King (5th generation farmer) at their offices in Asheville for a brief introduction to their business. 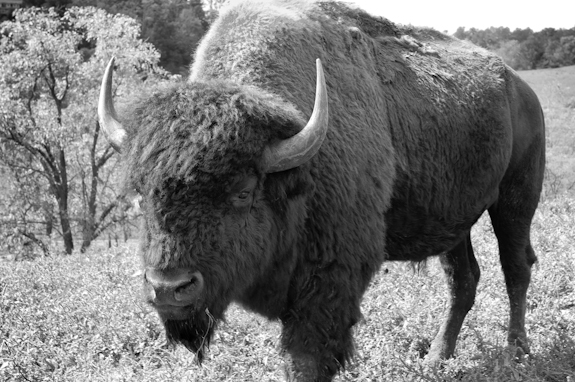 Dr. King, who also owns King Bio (a natural and homeopathic pharmaceutical company), started raising bison in 1985. Dr. King grew up on a cattle farm, so farming is not new to this family, but raising bison was. Dr. King, (a doctor of chiropractic and naturapathic medicines), began getting involved in holistic health in the late 1970’s. It was then that he started reading studies about the health benefits of eating bison meat. Bison has less fat than fish, half the calories of beef and has more protein and iron than beef. 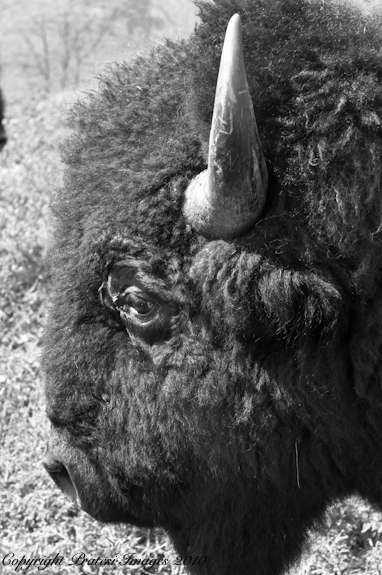 Dr. King said that studies have shown that a diet that included bison lowers cholesterol and triglycerides. People eating bison were reporting that they felt better in general, had more energy, fewer headaches and improvements in arthritis and allergies. There was such a broad spectrum of positive benefits that it really caught Dr. King’s attention. So, in 1985, Dr. King began raising bison with 23 head (originating from gold and silver trophy champions from Denver and several from North Dakota). 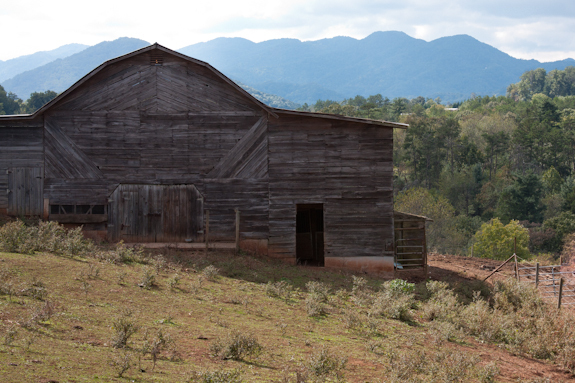 The farm began in Pennsylvania and eventually was relocated to the Asheville area. 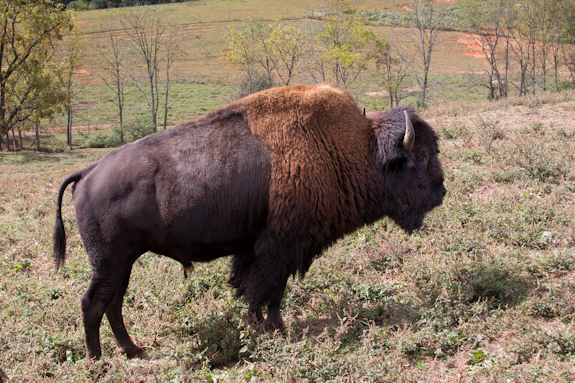 Today, Carolina Bison has 600 head of bison, which is the largest herd in the Southeast. There are currently between 250,000 – 300,000 head of bison in the U.S. and between 500,000 – 600,000 in the Northern Continent. You have “honored the animal”, indeed! Those Bison are intriguing. Thank you for such an informative post. I’ll be certain to be on the look out for bison meat. What a beautiful way to celebrate your birthday. Happy (belated) Birthday! Gwen has once again enjoyed a unique visit to a farm where many of are able to have a ‘mind’s eye view’ of the beautiful bison herd. Thanks for both the close-ups and vistas! I hope that this healthy meat becomes more popular and more available to everyone who is interested in agricultural sustainability and healthy eating and living! Kudos to the Kings! I can’t believe it but my cousin raises (or raised for many years) bison just in the Asheville area! What a small world! And I can’t believe you got that close. Just pass me a couple of those sliders and I’ll stand back! Happy Birthday!!! They look like such gentle animals. This post reminds me that I have a package of ground bison in the freezer. It’s a good time to try this slider recipe. Another great article! The photos and information are great! Thanks so much for your continued support of “Local” food and giving us another source for North Carolina Goodness! Your posts should be collected in a book. Each one is so thoughtful, and I find myself forwarding your page to friends near and far. I loved seeing these majestic creatures, and I agree that it makes you truly appreciate the meat that you do consume. Your photographs were beautiful, your writing was thoughtful and your recipe was mouth-watering. Thank you for sharing with me. Have a great afternoon! This was terrific. Gwen did an amazing job of expressing the conflicted feelings I have as one who tries to be a “conscientious carnivore”. I grew up around very good ranching practices, committed to free range pasturing – way before it was in the public awareness, so really enjoyed reading Gwen’s perspective as she experienced her first-hand discovery of those practices…really does increase that commitment to making very conscious choices about where our food comes from. Thank you for sharing this! This is the kind of field trip I want to take! Beautiful scenery, educational, and best of all..delicious! Great post Gwen! The photos are excellent! That was such a fun day! Hope you both are well and come back to Asheville soon! The sad irony is that you are “celebrating” the buffalo as they give up their lives to feed you. As though they have a choice. You do not need to eat buffalo to survive, or even remain healthy. This is a lark for meat-eaters. In fact, you need eat no meat at all to remain healthy. Shame on you for this hypocrisy. Can we come for a visit. My husband just had a heart attack and our lifestyle is now changing. My nephew buys bison meat and he tried it and liked it. Do u sell to to the public? You will need to contact the farm directly. 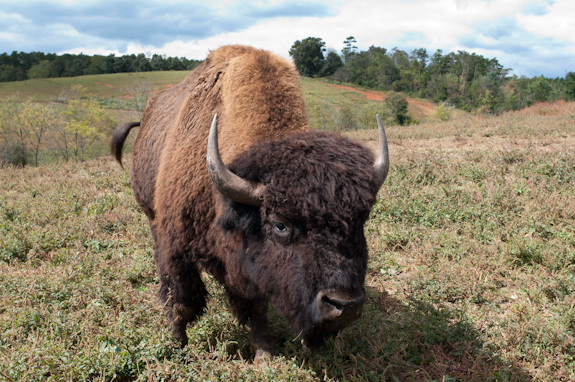 We just wrote about Carolina Bison. Their contact information for farm tours is 828-772-9274. They do sell to the public, so look at their website for information. Their meats are also available at Harris Teeter stores. Many grocery stores, including Whole Foods, see bison meat now. Whole Foods sells a number of cuts as well as ground bison.